Some users are so disconcerted by the loss of control in their hand, they ask to have the machine turned off after only a few seconds. Others experience the machine-induced tremors with less anxiety, knowing they can easily turn off the device and stop their muscles from jerking. Parkinson's patients don't have that option. The SymPulse Tele-Empathy Device, which simulates the involuntary twitches felt by Parkinson's patients in the hand and lower arm, is benign-looking: a black armband of electrodes wrapped around the forearm. 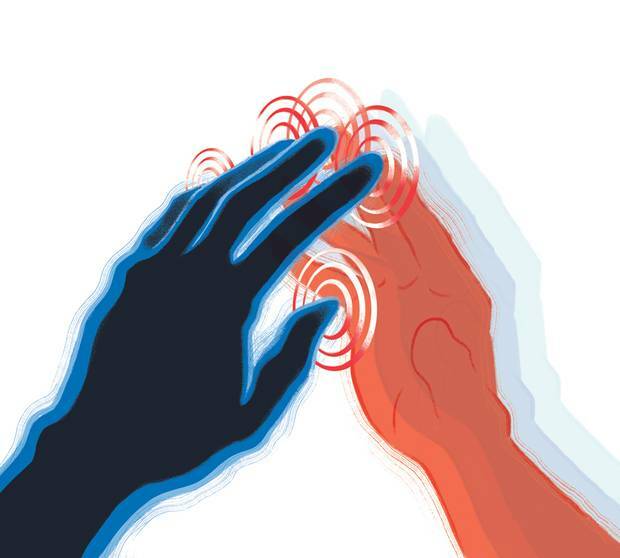 It sends electrical pulses contracting muscles down into the hand, on and off, on and off, although the sensation doesn't feel rhythmic. And the pulses can be altered to mimic the strength and timing of the tremors felt by a specific, individual patient, allowing a doctor or loved one to feel what the actual patient sitting across from them is feeling. Yan Fossat, vice president of Klick Labs at Toronto-based Klick Health, developed the device. He describes it as "a booster shot of empathy" for physicians. "The basic concept is essentially that if you as a doctor can feel what a patient is feeling, and truly feel it because now your nervous system will be doing exactly what [a patient's] nervous system is doing, then you would have a stronger empathy for what they are feeling," said Fossat. Klick Health provides marketing and management-related business services to the health-care industry. Klick Labs SymPulse Tele-Empathy Device. Empathy is increasingly a focus in patient care and, naturally, it has entered the sphere of tech gadgets. The device is one of many aimed at reducing the doctor-patient divide. There is, for instance, the " aging simulation suit," meant to mimic what it's like to be a frail senior, and then there are gadgets being developed by Klick to simulate what the constricted air flow of patients with chronic obstructive pulmonary disease feels like, or the neuropathy suffered by diabetes patients with damaged nerves and blood vessels in their extremities. The idea is to give caregivers and family members a truer glimpse into an illness and, ultimately, to create more compassionate care. The broad consensus throughout the medical community is that any extra measure of empathy and better understanding between physician and patient is a good thing. And simulation devices could aid this, said Virginia Roth, senior medical officer for medical affairs and patient advocacy at the Ottawa Hospital. On the flip side, patients already can easily tell when a physician or caregiver doesn't seem empathetic or attuned to them. "I think what we've lost as a profession is that personal touch, seeing a person not as an illness, but as who they are," Roth said. "Parkinson's patient A is very different from Parkinson's patient B: what they are experiencing? What's important to them? What is their story? There is a huge renewed interest in the medical profession to recapture some of that art and personal side of medicine." However, the medical community tends to wrap empathy in with the subject of physician or caregiver burnout, said Gordon Wallace, a physician and managing director of the Safe Medical Care program at the Canadian Medical Protective Association. The two go hand in hand, he indicated. Signs of burnout can result in lack of compassion or a physician feeling disengaged from work. Advice to prevent this tends to revolve around physicians and caregivers being more mindful and resilient, two ubiquitous words in any walk of life these days. The premise is that doctors need to take care of themselves if they are to take care of patients. Here is where simulations gadgets could perhaps help take caregivers out of their complacency or burnout. Yet, Wallace indicated that empathy won't grow merely by the use of a device. It would have to become part of the larger dialogue between doctor and patient. It would join the narrative that unfolds over the course of medical care. It's a narrative that's intricate, with many potential pitfalls, cancelled appointments, unanswered questions, perhaps a lack of understanding. How, then, would Klick's device fit within the course of this physician-patient relationship? How would the simulation alter that relationship? Will it matter that different physicians will inevitably have different reactions to the device? Klick plans to clinically test the tremor device's effectiveness by surveying 200 or so doctors, Fossat said, to determine if the physicians' empathy changed after using the device. This will be measured through a series of standardized questions on patient care. The study is expected to be completed by year's end. When I tried the device, Fossat first spritzed my arm with water. This helps to conduct the electrical pulses. Then he strapped the electrodes around the forearm. They are connected to a small device sending the pulses. After a quick, blip-like sensation, the pulses kicked in. My hand twitched mildly, but unceasingly. After 10 minutes, the main sensation was simply fatigue. Fossat and a technician hinted that this was longer than most people try it and that I'll likely feel the ghost of a twitch for the rest of the day. I didn't though. I could write normally with the trembling hand. I could hold a small cup and drink from it. I also found myself doing what apparently many do, instinctively resting my hand on my leg to try to calm the sensation (which accomplished the opposite, since consciously trying to rest the muscles actually makes the twitching more pronounced). I asked to have the strength turned up, which Fossat did by spraying more conductive water and reapplying the device. The sensation didn't change, but everything else did, including speaking and even just sitting. Everything felt more of a deliberate act. My overwhelming instinct was to slow everything down, to add more of a conscious balance in the rest of my body to the unconscious tremors. Fossat noted this. Everyone reacts differently, he said. The end effect was to be reminded how strong people are in facing disease, how strong a hindered human body is in still going about the day. But there's a lot the device can't do. Parkinson's patients' muscles can become rigid, in a state of perpetual contraction, rather than assuming a normal resting state, so each tremor for them can be a further contraction on top of a contraction. The armband doesn't fully replicate this. Nor can any brief demonstration, in an electronics and digital lab in the middle of a corporate office in downtown Toronto, come close to the physical and mental drain of the actual disease, seeing specialists, awaiting diagnosis, readjusting one's life to the sheer accident of illness. But in some ways, the device isn't trying to do all of that. The idea is simply to give non-patients a feel for the physical tremors, not the panoply of emotions and sympathy surrounding them. And here is where Fossat, who comes from a background in science and medical technology, distinguishes empathy from sympathy. "A lot of people who are sick receive sympathy. But empathy is much more technical," he said. "That doesn't mean there is no need for emotions, but [empathy] is more profound in the understanding of what a patient is going through. Out of that you can generate sympathy, but it starts with empathy. "The old expression of walking in somebody else's shoes, that's empathy."